Cherai is a long stretch beach with beautiful sand and coconut trees. The place is a unique combination of sea and backwaters rimmed by lush green coconut palms and paddy fields. The 15 km long golden beach is one of the most beautiful beaches in Kerala. A beautiful village near Kochi in India.Cherai Beach is noted for its scenic beauty.Cherai Cherai is a region in the island of Vypin, a suburb of the city of Kochi, in the state of Kerala, India. 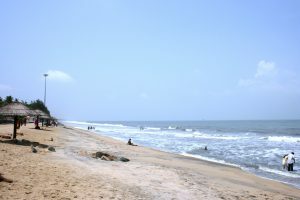 Cherai has the longest beach in Kochi – the Cherai beach. Cherai Beach has the calm serene Backwaters on the other side and the land is filled with coconut trees. The beach is located towards the centre-north of the Vypin island.The Cherai Beach is 10 km long. Cherai has played an important role in the history of modern Kerala by becoming the birthplace of two prominent political personsages of modern Kerala – Mathai Manjooran and Sahodaran Ayyappan. Part of the island of Vypin and blessed with a unique blend of sea and backwater, Cherai is an exotic mixture of nature, culture and history. It is a beautiful village near Kochi in India. Cherai Beach is noted for its scenic beauty. Cherai is a region in the island of Vypin, a suburb of the city of Kochi, in the state of Kerala, India. Cherai has the longest beach in Kochi – the Cherai beach. With the Periyar River to the east and the Arabian Sea westwards, Cherai also offers vast stretches of luminous green coconut groves, paddy fields situated below sea level, a shoreline of secluded golden beaches, an occasional school of frolicking dolphins and tranquil stretches of scenic backwaters with Chinese fishing nets along the banks. Chera’s tryst with history includes the fabled ancient port of Muziris and in being part of the European colonial era in Kerala. The area contains several historical temples, churches, mosques and monuments of antiquity. Muziris was an ancient seaport of renown, set beside the Periyar River, center of the spice trade to West Asia and Europe and believed to have existed from around the beginning of the Christian era. Muziris finds mention in classical Tamil Sangam literature and in numerous European historical sources. The prosperous port of Muziris (Muziris Heritage Tour) , at the mouth of the Periyar, overlooking the Arabian Sea was engulfed and silted over by the flooding of the river, leaving its actual site to conjecture. The excavations (Muziris Heritage Excavations)by the Kerala Council for Historical Research (KCHR) in 2007 & 2008 unearthed the archaeological and historical evidence which confirmed its location. In a massive flood of the Periyar in 1341, the port was said to have been partially destroyed and the river silted. The centres of commerce, over a period of time, shifted to other ports on the Malabar Coast. Soon the exact location of Muziris was forgotten. Currently, it is believed to have been located close to present day Kodungallur town. The unique position enjoyed by Cherai in the tourism map of Kerala stems from the fact that it is strategically located. One side borders the Arabian sea and the Vembanad Kayal ( Backwaters) borders the other side. The beach frontage and the backwaters frontage has given Cherai such magnificent scenic beauty that it is doubtful if such beauty spots exist any where else in Kerala. Added to this is the chance to view the village life of a gentry where prawn farming is resorted to at every corner. The sight of coconut trees caressing in the winds and the long line of paddy fields have all made Cherai the favourite destination of globe trotters. Cherai is the latest tourist craze in Gods own country and undoubtedly with some genuine reason.